Not all crane hire companies in Perth have the same array of Tom Thumb cranes as we do here at Myaree, so get in touch for a lifting assessment and we’ll let you know which of our Perth city cranes makes the best fit. Like all rough terrain slewing cranes, it makes little difference if the ground is pitted and uneven. Tom Thumbs go rolling on through with all-wheel drive, making them among the most versatile models for mobile crane hire. With a Telescopic Boom reach of nearly 24m, this Tom Thumb crane will be able to lift and reach into the tightest of places! Tom Thumbs are ideal for residential lifting work. Perhaps you need some bulky furniture hoisted up onto the second storey, or maybe you’ve just treated yourself to a new pizza oven or a spa bath and you want them installed in your garden ready for summer. Whether it’s a single oversized sofa or a complete house move, get in touch so we can determine the best approach. City cranes like Tom Thumbs are also tailor-made for construction work. These nimble little cranes are rugged and capable of navigating even the rockiest and most uneven ground. Whether you want to hoist brick packs or shift timber bundles around the site, contact Myaree Crane Hire and one of our experienced team members will be able to assist you to make it happen. Tom Thumbs work brilliantly inside small workshops, too. They’re exceedingly manoeuvrable yet also capable of lifting substantially heavy loads. With so many crane hire companies in Perth, why should you roll with Myaree for slewing crane hire? Myaree Crane Operators are all fully licenced for any type of high-risk work, and it goes unsaid we’re fully insured and comply with all OHSE regulations. It’s not just efficiency you’ll get, but also service with a smile. With Franna cranes, slewing cranes, and Tom Thumbs, we’ve got the power you need for even the heaviest lifting. When the going gets really tough, we can send in multiple cranes capable of working in tandem to hoist the heaviest and most awkward machinery, boats, or equipment. 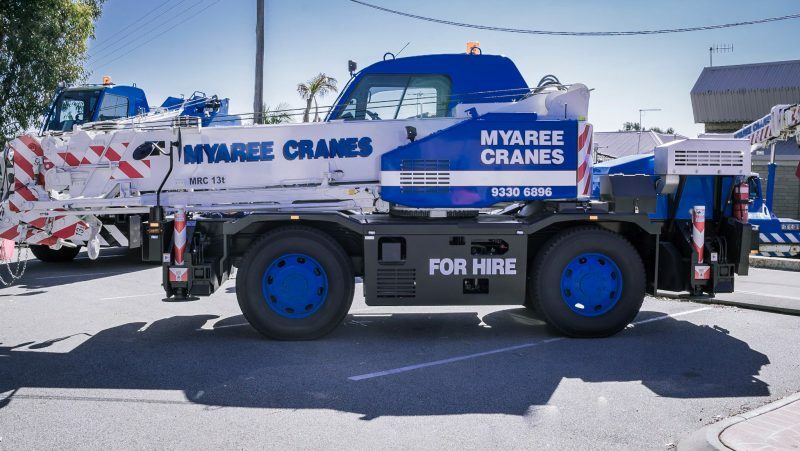 If you need a crane hire in Perth, it’s got to be Myaree. We’d like to be the only number you call whenever you need heavy lifting done. If you work with us once, we’re confident you’ll be back for the next job.